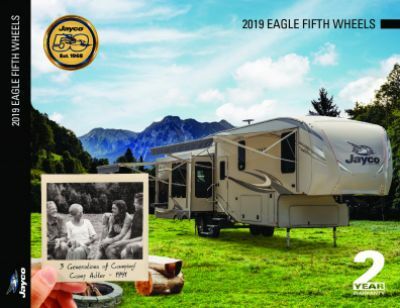 No doubt, the 2018 Jayco Eagle 347BHOK is one of the premier RVs you'll find anywhere! If you've got the itch to own this great 5th Wheel then see us today at All Seasons RV! Located in Muskegon, Michigan, we're one of the largest dealers in the midwest and #1 in customer satisfaction thanks to our huge inventory and amazingly low prices! So stop in and see us today at 4701 Airline Rd Muskegon Michigan 49444 and let one of our friendly, knowledgeable staff show you how you can save $1000s on your dream RV! And with our fast, store-to-door delivery anywhere in North America, you can be on the road in your new Eagle 347BHOK in no time - no matter where you live! A 17' 0" awning is located along the side of this 5th Wheel. This rig has a GVWR of 14850 lbs, and a hitch weight of 2270 lbs. 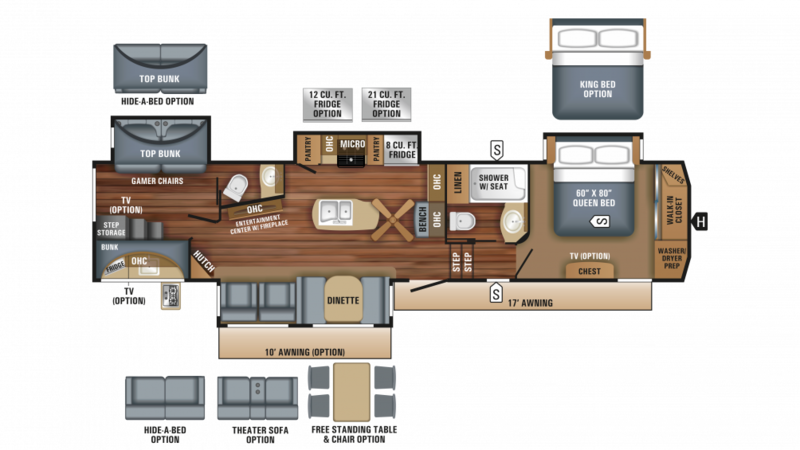 There are enough roomy sleeping accommodations for up to 6 people. The master bedroom boasts a big, comfortable Queen bed that will ensure a cozy and restful trip to dreamland every night! Before you leave home, stock up the kitchen with tasty food and drinks for the road! All of your fresh produce stays fresh in the 8.00 cu. ft. refrigerator, and you can make dinner in a pinch with the convenient 3 burner range cooktop! There's also a freshwater tank with a capacity of 75 gallons, so load it up for clean water all vacation long! If you'd like to shower in comfort and privacy on the road and avoid the hassle and mess of the cold, damp campground community bath, you can do it easily with the bathroom, complete with shower and Porcelain Foot Flush toilet! Everyone in the family can enjoy this amenity, thanks to the 75 gallon freshwater tank and 60 lbs. of LP tank capacity! Waste and used water are stored in the 87 gallon black water tank and the 87 gallon gray water tank, respectively. When the sun is shining and the fun is outside, why should you go inside to make a meal? Cook up a delicious treat for the family without missing a second of fun and sun with the outdoor kitchen!